(DV) Solomon: Thomas Friedman, Liberal Sadist? Such a line of reasoning points to sending still more U.S. troops to Iraq. The result, predictably, would be even more mass slaughter from various directions. But there’s no reason to believe such a result would chasten Friedman, as long as the eminent pundit figures the Washington-backed killing is for a righteous cause. In recent years Friedman has expressed much enthusiasm -- even relish -- for launching and continuing wars underwritten by U.S. taxpayers. During the last decade of the 20th century, Friedman was a vehement advocate of -- in the words of a January 1998 column -- “bombing Iraq, over and over and over again.” In early 1999, when he offered a pithy list of recommendations for Washington’s policymakers, it included: “Blow up a different power station in Iraq every week, so no one knows when the lights will go off or who’s in charge.” Such disruptions of electricity would have deadly effects, from hospitals to homes where vulnerable civilians live. Evidently, Friedman could not let those considerations get in the way of his snappy prose. But is it unfair to say that Friedman seems to get a charge out of urging systematic infliction of pain and death? Well, consider his fixation on four words in particular. During the spring of 1999, as the U.S.-led NATO bombardment of Yugoslavia went on, Friedman recycled his witticism “Give war a chance” from one column to another. “Twelve days of surgical bombing was never going to turn Serbia around,” he wrote in early April. “Let’s see what 12 weeks of less than surgical bombing does. Give war a chance.” (He used the same motto in a Fox News interview.) Another column included this gleeful taunt while vicariously threatening civilians in Yugoslavia with protracted terror: “Every week you ravage Kosovo is another decade we will set your country back by pulverizing you. You want 1950? We can do 1950. You want 1389? We can do 1389 too.” As on so many other occasions, Friedman’s pronouncements gave off more than a whiff of pleasure at the spectacle of other people’s anguish. 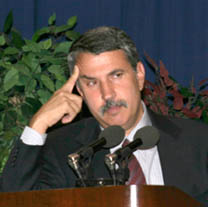 If words truly matter, then maybe it’s consequential that some of Thomas Friedman’s words -- including his flippant and zealous endorsements of mass killing -- have the odor of sadistic cruelty. Norman Solomon is the author of the new book War Made Easy: How Presidents and Pundits Keep Spinning Us to Death, from which this essay is adapted. He can be reached at: mediabeat@igc.org. * News Media and "the Madness of Militarism"